This thoroughly weatherized speaker will knock you out with its big sound and awesome feature set. 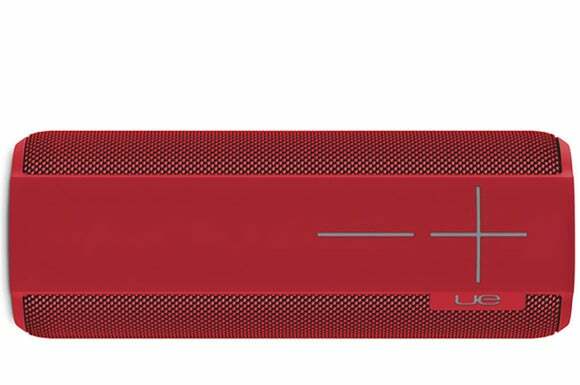 Ultimate Ears slammed down the gauntlet with its Megaboom portable Bluetooth speaker. This loud-and-proud, thoroughly weatherized speaker produces enough sound to fill the average backyard, and it comes with a richly featured app that will make it the life of any party. A pair of 2.0-inch full-range drivers and dual 2.0 x 4.0-inch passive radiators in a cylindrical enclosure create a near 360-degree sound field. The 1.93-pound speaker comes with a plastic carrying case that makes it easy to take just about anywhere, and its built-in rechargeable battery is rated to last up to 20 hours. Big sound and a richly featured app will make this speaker the life of any party. Large plus and minus buttons on the the Megaboom’s face let you raise or lower in the volume manually. Its cap ends are rubberized, with the top end carrying the unit’s power and Bluetooth-pairing buttons. The Megaboom isn’t a Wi-Fi speaker, but its range sure makes it feel like one. That’s largely because it’s outfitted with Class 1 Bluetooth radio rated for line-of-sight wireless range of 100 feet. You’ll get less than that in the real world, where physical obstacles will be between your smartphone or tablet and the speaker, but most of its competition is outfitted with Bluetooth Class 2 radios rated for range of about 30 feet. You can pair two Megabooms simultaneously, reducing the frustration many of us have had with older Bluetooth devices that must be paired one at a time. And support for NFC (Near Field Communication) makes pairing even easier—just tap the source against the speaker and you’ll never have to drill down into your device’s control panel. The UE Megaboom can withstand being dunked in up to three feet of water for up to 30 minutes, yet its mesh speaker grill is sonically transparent. The Megaboom has a built-in microphone, so you can use it as a speakerphone when paired with your smartphone. It won’t put conference-room vendors out of business, but I used it while on vacation for a conference call and it worked as advertised. An Android and iOS app adds even more functions, including the ability to customize the color of its user interface to match the speaker—a cool attention to detail. Three other features are particularly noteworthy: An Alarm clock, EQ customization, and double-up mode. You can configure the Megaboom to serve as a one-time or daily alarm clock, playing either your favorite song or whichever song played last. Since your room plays a major part in how a speaker ultimately sounds, the Megaboom’s EQ allows you to tailor the speaker for the particulars of its playback environment. You can apply extra bass when you’re using the speaker in a wide-open space such as your yard, for example; and there’s a small-room EQ setting that tamps down those lower frequencies when you’re using the speaker in a small room. If you really want to get down to brass tacks, you can create custom EQ settings to your heart’s content. I found that this feature did an admirable job addressing characteristic problems in both open spaces and when I placed the Megaboom against a wall. Removing the gasket on the Megaboom’s bottom reveals the micro USB charging port and 3.5mm analog input. The gasket must be re-secured for the Megaboom to maintain its water-resistant rating. 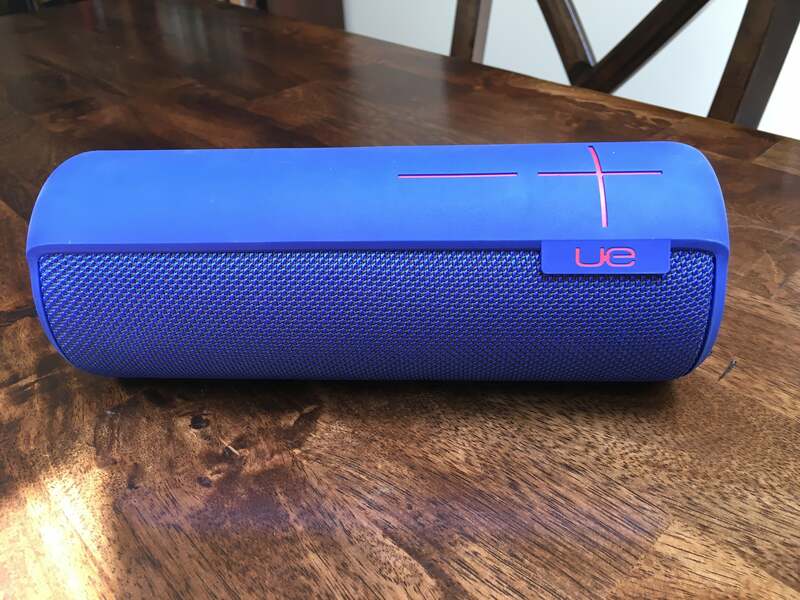 Double Up allows you to pair two UE Megaboom speakers together. You can configure them to function as a stereo pair (great for outdoor movie night) or as a mirror of each other, which will allow you to fill even larger spaces or pump up the volume. This feature isn’t intended to serve as a multi-room wireless option, as Bluetooth signals aren’t typically good at penetrating walls, but you could give it a shot. If you were to turn the Megaboom on its side and use it as a battering ram that would pretty much sum up the speaker’s take-no-prisoners approach to music. Small rooms, big rooms, open spaces—the Megaboom will easily fill them with sound. 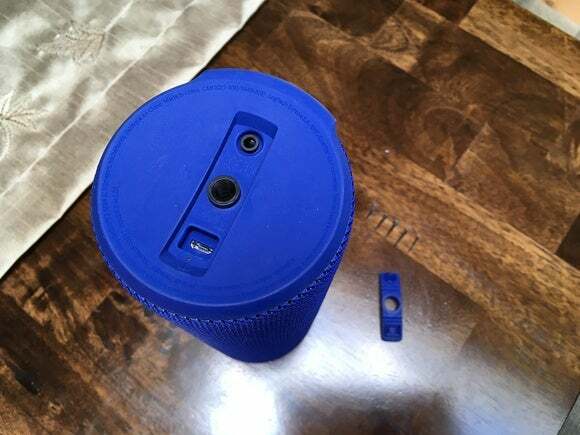 No matter how loud I cranked the Megaboom—to ear-piercing volume levels, really—in my large dining room/living room space, this speaker never broke a sweat or surrendered under the weight of extreme harshness or compression. It’s 360-degree design also does a remarkable job of reducing off-axis coloration. 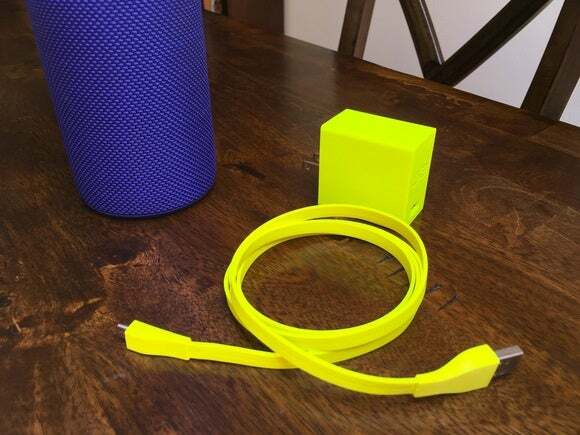 The Megaboom charges via a standard micro-USB cable. Thanks to its vibrant color, you won’t lose the included cable and wall adapter on the beach or the backyard. The Megaboom’s sound does accentuate the bottom end. Because of its cylindrical design, it doesn’t have the precise, pinpoint imaging and open mid-range that some of its competition in this price range deliver. Those quibbles aside, this speaker consistently delivered great—thought not textbook perfect—performance regardless of the environmental conditions I put it in. Sitting on a camping facility deck in New Hampshire, my wife and I listened to several jazz, rock, and classical albums. I ran through my standard repertoire of songs for this review and whether it was Adele, Tom Petty, Dido, Patricia Barber, or Norah Jones, the Megaboom performed consistently, effortlessly filling the vast outdoors with music. The Megaboom rocks. It’s almost perfect balance of design, sound, and features make this one of the best all-around, portable Bluetooth speakers on the market for in-home or outdoor audio. This story, "Ultimate Ears Megaboom Bluetooth speaker review: Built to be the life of the party" was originally published by TechHive.